The Crux du Connoisseur is one of three new cigars that made its debut by Crux Cigar Company at the 2015 IPCPR Trade Show. Crux Cigar Company launched back in 2014 and in less than two years has already built up an impressive portfolio of ten different lines. The company was formed by Jeff Haugen and Joel Rogers, the owners of Tobacco Grove in Maple Grove Minnesota. The duo has looked to build on their experience on the retail end as they enter the world of manufacturers. The company partners with the Placencia factory in Nicaragua. Today, I take a closer look at the Crux du Connoisseur in the No. 2 (6 1/2 x 38) format. Overall I found this to be a real impressive cigar and a solid addition into the Crux Cigar Company portfolio. The Crux du Connoissuer along with the Crux Guild and annual limited edition Crux Limitada PB5 were Crux’s 2015 IPCPR Releases. The “du Connoisseur” name can be derived from the fact that all three vitolas in the line are what are typically called “connoisseur” sizes – namely 38 ring gauge and under. Small ring gauges are nothing new for Crux Cigars. Lines such as the Ninfamaniac, Ninfamaniac Dark, Skeeterz, and Sports have all been releases that have 35 ring gauges and under. While this may be against the grain in terms of today’s market of 50+ ring gauges, the company has been successful thus far. Without further ado, let’s take a closer look at the Crux du Connoisseur No. 2 and see what this cigar brings to the table. 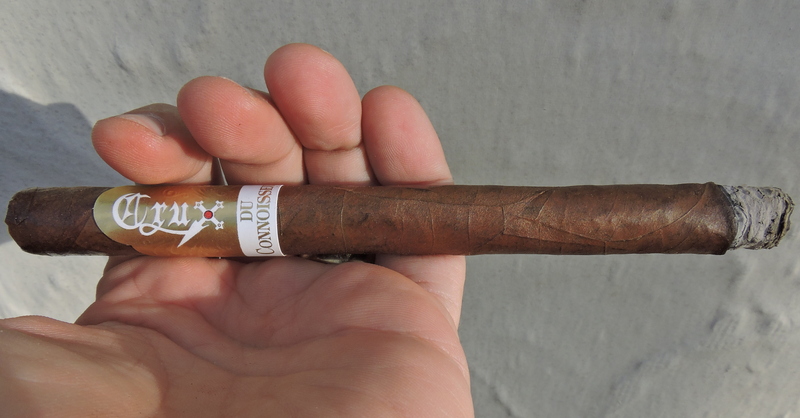 The Crux du Connoisseur consists of a Nicaraguan wrapper and binder with Honduran filler. The Crux du Connoisseur comes in three sizes. Each are 38 ring gauge and under. Each of the three sizes are packaged in ten count boxes. The No. 1 and No. 2 are essentially lancero-sized vitolas that differ in length. 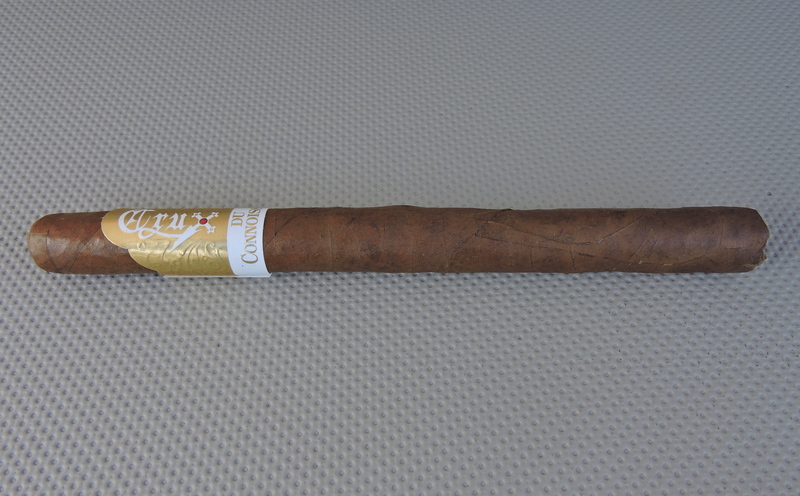 The Nicaraguan Habano wrapper of the Crux du Connoissuer No. 2 has a dark caramel color. Depending on how the light shines on it, it will show some rosado tint. Upon closer examination, there is also some subtle darker marbling. The wrapper has somewhat of an oily complexion and the surface of the wrapper is slightly bumpy. There are some visible veins, but most of the wrapper seams are well hidden due to the darker color of the wrapper. The band to the Crux du Connoisseur is primarily gold and white. In landscape mode is the white and Crux cigar logo with a red jewel on the center of the “X” sitting on a gold foil-like background. The lower part of the band is white with the text “DU CONNOISSEUR” in gold font on a white background. The far right has a gold “crusader-like” dagger with a red jewel design in the middle. Prior to lighting up the Crux du Connoisseur No. 2, I went with my usual choice of a straight cut to remove the cap. Once the cap was removed, I proceeded with the pre-light draw ritual. The dry draw provided a mix of caramel, natural tobacco, and cedar. Overall I considered the pre-light draw of this cigar to be excellent. At this point I was ready to light up the Crux du Connoisseur No. 2 and see what the smoking phase would have in store. The Crux du Connoisseur No. 2 started out with a mix of cedar and red pepper. The spice quickly subsided and the caramel and natural tobacco notes from the pre-light resurfaced. It didn’t take long for the caramel and natural tobacco to move to the forefront. At this time, the cedar and red pepper notes moved to the background. I also picked up the red pepper and cedar on the retro-hale. The caramel notes started to transition to a coffee note. By the middle of the first third, the transition was complete and the coffee had displaced the caramel. The coffee and natural tobacco were now the primary notes. The red pepper and cedar remained secondary. I also picked up a creamy note in the background. The coffee and natural tobacco notes alternated as to which was the primary note. By the second third, the natural tobacco notes transitioned to more of an earthy note. Meanwhile, some subtle nut flavors joined the spice and cream in the background. By the last third, the nut and cedar notes joined the earth as a primary note. I found the coffee notes receded into the background joining the red pepper notes. This is the way the cigar experience of the Crux du Connoissuer No. 2 came to a close. The resulting nub was outstanding – firm to the touch and cool in temperature. When it came to the burn of the Crux du Connoissuer No. 2, I found this core scored quite well. There was a slight curvature to the burn line, but overall the cigar maintained a straight burn path. This was a cigar that only required occasional touch-ups with the lighter. Meanwhile, the resulting ash had a silver gray color. The ash itself was firm and came off in clean chunks. The burn rate and burn temperature were ideal. Sometimes when it comes to lancers-sized cigars, they can be plagued by tighter draws. This was not the case with the Crux du Connoissuer No. 2. While there was a touch of resistance to the draw, this was ideal in my book and not a negative. The cigar also delivered a nice amount of smoke production. The smoke production surprised me as I would have expected a looser draw to deliver a higher smoke production. In terms of strength, I found the Crux du Connoisseur No. 2 to fall on the upper end of medium. Throughout the smoking experience, the strength level remained in this range of the spectrum, but never crossed into medium to full strength territory. In terms of body, I also found the Crux du Connoisseur No. 2 to also fall on the upper end of medium. As the cigar experience progressed, the body grew and by the second half, the Crux du Connoisseur No. 2 was smoking as a medium to full-bodied cigar. In terms of strength versus body of the No. 2, I gave the edge to the body. I’ve been on the record before by saying I don’t think lanceros are the greatest thing since sliced bread. It doesn’t mean I don’t like lanceros – it simply means that a lancero doesn’t automatically translate to greatness and each lancero must be judged on its own merit. When it comes to the Crux du Connoisseur No. 2, one thing was quite clear to me – this is a blend that was really made for the 38 ring gauge format. The Crux du Connoisseur No. 2 delivers great flavor, has a nice amount of complexity, and excellent construction. When it does come to a 38 ring gauge cigar, I like the 6 1/2 length better than a 7 inch or greater, so this is another plus this cigar has going for it. The Crux du Connoisseur No. 2 is a cigar I would recommend to an experienced cigar enthusiast, but it also is a cigar I wouldn’t hesitate to recommend to a novice. As for myself, this is a small ring gauge cigar I would reach for. It’s a cigar certainly worthy of a box split.